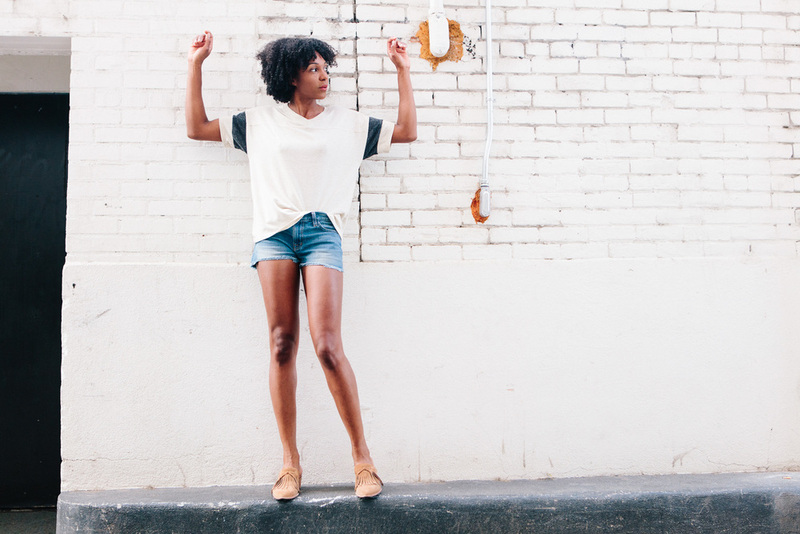 Can I get an amen for good old basics like t-shirt and shorts?! ( hands in the air). I am certainly getting to a point where I want to simplify my wardrobe and have great styles that I can throw on, go ( the hubby would appreciate that ;) and look fabulous, of course. This is something I tackle for my clients who are busy bees and don't have time to spare when it comes to looking pulled together effortlessly. So the key is....stick to awesome basics with a few wow pieces to make sure the style factor is happening :) So how do we make that happen?? With my casual wear, I start with what feels comfy and can be worn a few different ways. In my book, that's t-shirt styles and denim. I'm wearing the powder puff eco- jersey T-shirt from Alternative Apparel. The styles from Alternative Apparel are not only fantastic, they also have an amazing platform that provides eco friendly wear that's sustainable and through fair labor in accordance to the FLA and WARP. Back to basics can include a bigger initiative than just less clothes, it can be even more impactful by the clothing you choose. Loving on that! I finished the look with these comfy denim shorts from Current Elliot and fringe slides from Madewell. These shoes takes this outfit up another level. I seriously do the "happy dance" when I wear these. I'll teach you guys my happy dance one of these days...it does require dropping it low, just a wee bit ;) This is what I meant about adding those little wow pieces to your great basics, which will make those beauties shine! Basics is so far from boring. It can allow your closet to have a great anchor so that you can add in those fun trends or cool one of kind piece if you fancy, which makes your look, all the more special.